• Commentary - this vintage commentary was initially included on Criterion's LD edition of The Princess Bride. It features director Rob Reiner, writer William Goldman, producer Andrew Scheinman, and actors Billy Crystal and Peter Falk. • Audiobook - presented here are excerpts from the 1987 Dove Entertainment audiobook of William Goldman's novel The Princess Bride, read by Rob Reiner, and edited by Criterion in 1997. The feature makes it possible to compare scenes from the novel and the corresponding segments from the film. • True Love - in this vintage program, director Rob Reiner and actors Cary Elwes and Robin Wright recall their work during the shooting of The Princess Bride and discuss the film's massive success. The program was made in 2012. In English, not subtitled. (15 min, 1080p). 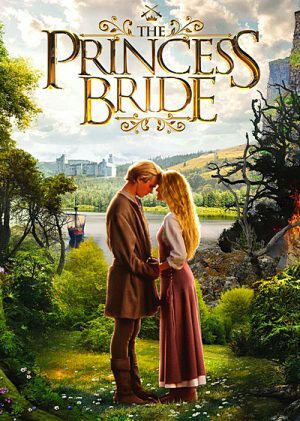 • Pure Enchantment - in this new program, Loren-Paul Caplin, writer and adjunct professor of screenwriting at Columbia University, discusses the unique qualities of William Goldman' novel and the screenplay that he produced for The Princess Bride. The program was produced for Criterion in 2018. In English, not subtitled. (18 min, 1080p). • The Tapestry - this new program examines the tapestries that author William Goldman commissioned from artist Carol Burland for The Princess Bride. The program was created for Criterion in 2018. In English, not subtitled. (8 min, 1080p). • Making of the Film - in English, not subtitled. 1. As You Wish - the vintage content that is gathered here focuses on the production history of The Princess Bride and features numerous archival cast and crew interviews, as well as comments from other actors and prominent fans of the film. The documentary was produced in 2012. (28 min, 1080i). 2. "The Princess Bride": The Untold Story - in this vintage program, actors Christopher Guest, Chris Sarandon, Fred Svage, and Robin Wright discuss the tremendous impact that the success of The Princess Bride has had on their careers and personal lives. The program was produced in 2007. (19 min, 1080i). 3. Fairy-Tale Reality - in this new video interview, art director Richard Holland discusses the visual style of The Princess Bride and some of the unique work that was done to make the fantasy world in which Westley and Buttercup fall in love look real. There are also interesting comments from an archival interview with production designer Norman Garwood. The interview was conducted exclusively for Criterion in 2018. (12 min, 1080p). 4. Miraculous Makeup - in this vintage program, Billy Crystal and makeup artist discuss the creation of the character Miracle Max. The program was produced in 2006. (12 min, 1080i). 5. Behind the Scenes - presented here is a collection of short videos that were shot during the production of The Princess Bride. Each features an audio commentary that was recorded for Criterion in 1997. 6. Cary Elwes Video Diary - the vintage footage that is gathered here was shot by Cary Elwes during the shooting of The Princess Bride, and is narrated by the actor and Robin Wright. (4 min, 1080i). • The Art of Fencing - in this vintage program, Hollywood sword master Robert Goodwin discusses the various period weapons and fighting techniques that were used in The Princess Bride. The program was created in 2007. In English, not subtitled. (8 min, 1080i). • Fairy Tales & Folklore - in this archival interview, scholar Jack Zipes (Faily Tales and the Art of Subversion) explains why people are drawn to fairy tales, some of the common themes that are represented in them, and the narrative construction of The Princess Bride. The interview was conducted in 2007. In English, not subtitled. (10 min, 1080i). • Trailers and TV Spots - vintage promotional materials for The Princess Bride.